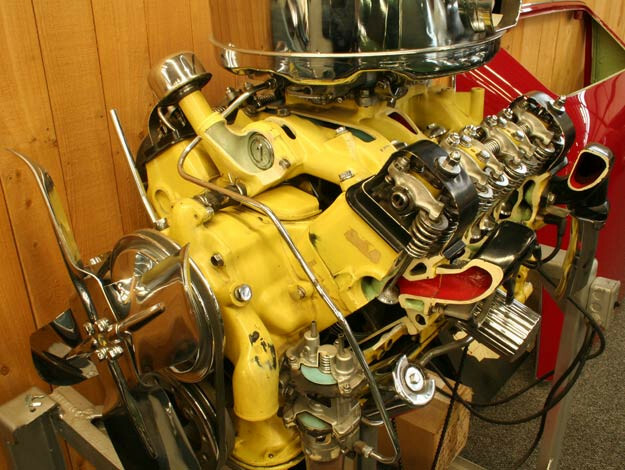 The displayed intake manifold along with the Ford four-barrel carburetor sitting on its top first saw duty in 1957 on the ‘D’ code 312 engines. Four-barrel intakes prior to this used the Holley 4000 series of carbs (more reverently known as Tea-pot carbs) or an earlier Carter design, both of which had a smaller mounting pad. 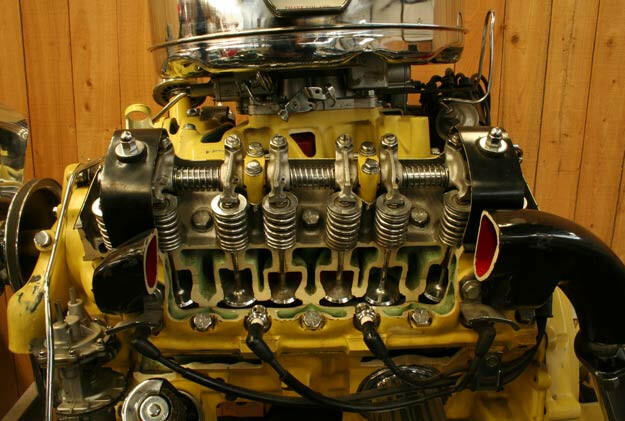 The Ford carburetor is potentially correct as the 312 could have received either the Ford, Carter, or Holley carb on the pictured intake. The first clue that this engine is a collection of parts rather than being a specific example are the rocker arms, as they are the screw and jam nut design, which were only used through the 1955 model year and were the 1.43:1 ratio. 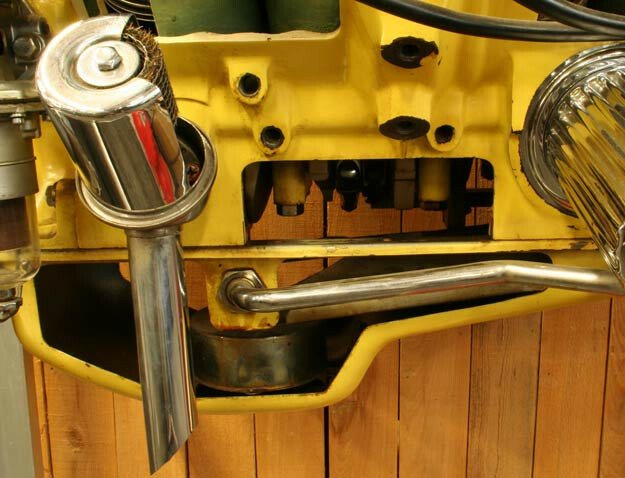 Starting in 1956, the rocker arms went to a screw that used a friction fit on the threads to hold the adjustment rather than a jam nut, while also having a ratio increase to 1.54:1. 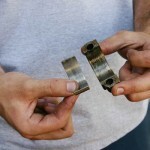 But before you think that this would be an easy way to tell the rocker arm ratios apart, starting in 1958, the rocker ratio went back to 1.43:1 but retained the friction fit adjustment screws. Looking at the back of the engine, there is the ’57 and up distributor. Prior to 1957, the Ford Y used a distributor that was referred to as the Load-O-Matic, which was smaller in diameter while also using a different design vacuum advance chamber. 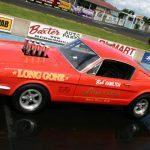 The earlier Load-O-Matic distributors were not very hot rod friendly and resulted in poor performance when carburetion changes were made without upgrading the ignition system accordingly. 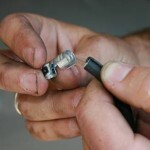 Another anomaly are the freeze plugs that are evident in the ends of the cylinder heads. This is a design feature that was phased out during the 1956 model year. The spark plugs appear to be the larger 18mm tapered seat plugs which rules out this particular set of heads as being from 1954, which used a 14mm sparkplug. 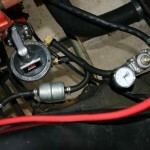 A spin-on oil filter is being used which was also introduced in 1957. Prior years used a cartridge filter but many of these were easily upgraded to the spin-on type. The pictured exhaust manifolds are the larger design as found on the 1957 and up models. Prior to ’57, the exhaust manifolds for the dual exhaust-equipped vehicles were smaller and more restrictive. Not shown in the pictures is the externally mounted oil pump which could be another clue if trying to identify the engine by year model. 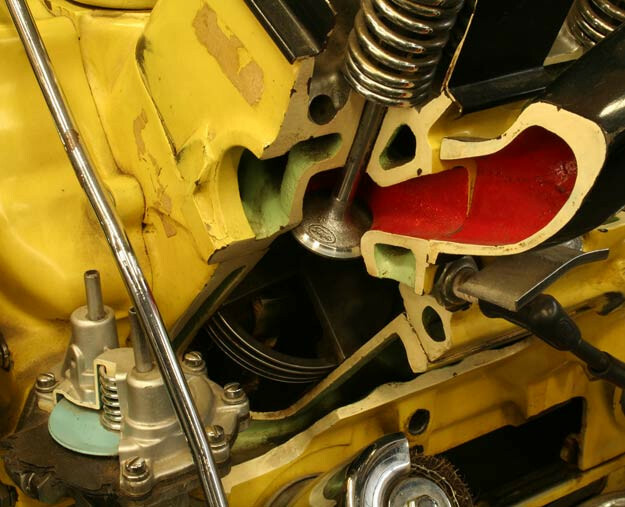 Prior to 1957, a spur gear design oil pump was used exclusively on the Y, but in 1957, beginning with use on the 312 engines, the gerotor design made its debut. 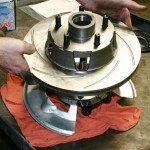 By the end of the Y-Block’s production run in 1964, all Y-Blocks were using the gerotor style of oil pump. There are no block casting numbers evident and the piston itself does not give a clue to the actual cubic-inch of the engine in question, so it could be a 239, 256, 272, 292, or 312 at this point. The yellow color is also not a clue as this was not a factory color. 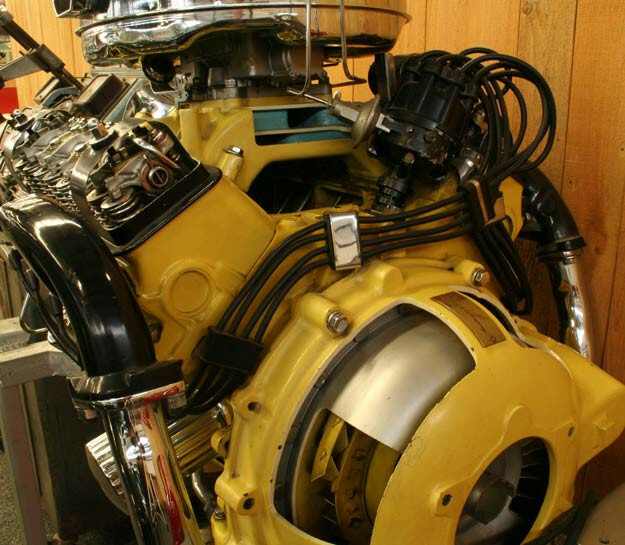 Regardless of the size or year of the display engine in question, it does still show the major attributes of what make a Y engine distinctive and in a class of its own. then the engine seals took the crank case pressure. Hence rear main leaked allot. 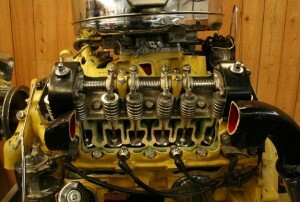 The 239 or 254 cubic inch intake manifolds not interchangeable with 272 292 312. A bad intake leak would result putting a 292 on a 254.
did find that the self locker would work on a pre 57 rocker arm. it filled the groove slowing the oil feed. I believe yellow was factory color for all large truck Y blocks I have owned several 2 tons and they were both yellow. What years did Mustang use the Black/Gold engine color combination?